When you think of World War I, you probably think of the technology that made this war so deadly: tanks, machine guns, gas attacks, and bombs. With so many deadly weapons at their disposal, it seems impossible that soldiers would need the humble horse to fight as well. But over a million horses were used by Great Britain alone during this war, and like their human counterparts, many of them didn’t return home. The first horses were acquired via purchasers who scoured Great Britain for some of the best draft horses. In the first twelve days of the war, 165,000 horses had been obtained in this way. However, it soon became clear that many more horses would be needed before the war was done. There were not a million horses to spare in Great Britain at the time, so a lot of the horses were taken from the North American plains and shipped off by the thousands to be trained for modern war. Many of these horses were half-wild, tousle-maned, and shoeless. However, despite all of their flaws, they were particularly suited to a variety of weather conditions that they would experience during the war. The first problem encountered while shipping the horses was that so many horses crowded into tight spaces meant that disease ran rampant. These horses were particularly susceptible to a type of pneumonia. Even those that weren’t ill weren’t necessarily in good shape when they finally landed in Britain after their journey across the pond. The Royal Veterinary Corps was put in charge of making these horses “fighting fit” before they were taken to the front lines. In 1918, over half of Britain’s horses were in France, while the rest were spread out across Europe. The majority of the horses were not used on the battlefield. In 1918, just over 75,000 were allocated to the cavalry, while nearly 450,000 horses and mules were used to lug supplies around. Another 90,000 were charged with carrying guns and heavy artillery, and over 100,000 were horses who were ridden around the front lines, carrying food and ammunition to soldiers and bearing the wounded across the trenches to hospitals. While the cavalry horses certainly saw a great deal of action, all of the horses were subjected to tough conditions and hardships wherever they worked. That said, it wasn’t enemy fire that killed the most horses—it was hunger, illness, and exposure to the elements that caused the British army to lose around 15% of its horses each year of the war. Of course, caring for that many animals would be difficult enough on a farm, let alone a battlefield. One of the biggest obstacles initially was that many of the men fighting in the war were from the city, and didn’t have any experience caring for horses before a war horse was put in their charge. Food was a major issue. Rations for each horse included “twelve pounds of oats, ten pounds of hay, and some bran” every week. Multiply that by a million, and you get problems with producing enough feed, not to mention transporting it to the horses who were spread out across Europe and under near-constant enemy fire. Often, the horses went hungry, and many also went without sufficient water. Shelter was another problem. Most horses were simply attached to a picket line without a roof over their heads. In the winter, this meant that they were subjected to cold, wet conditions. Their winter coat was most often clipped short so that any skin diseases could be easily detected, but this had the unfortunate side effect of taking away their natural source of warmth. However, with lice and mange running rampant among the animals, it was a necessary measure to try to keep them healthy. Needless to say, the horses were suffering right along with the humans. Heaving about in the filthy mud of the road was an unfortunate mule with both of his forelegs shot away. The poor brute, suffering God knows what untold agonies and terrors, was trying desperately to get to its feet which weren’t there. Writhing and heaving, tossing its head about in its wild attempts, not knowing that it no longer had any front legs. I had my revolver with me, but couldn’t get near the animal, which lashed out at us with its hind legs and tossed its head unceasingly. Jerry’s shells were arriving pretty fast – we made some desperate attempts to get the mule so that I could put a bullet behind its ear into the brain, but to no avail. By lingering there, trying to put the creature out of its pain I was risking not only my life but also my companions’. The shelling got more intense – perhaps one would hit the poor thing and put it out of its misery. 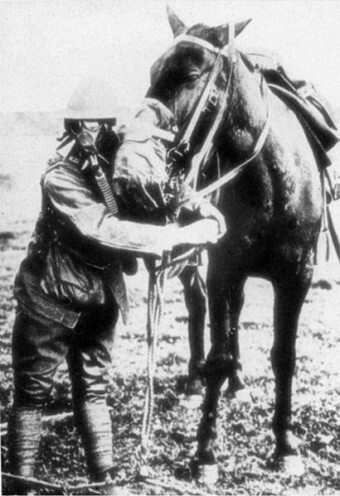 Despite all of the losses suffered by the ranks of British horses and the harsh conditions they endured, they were actually some of the best cared for animals in the war. For instance, the Brits provided their horses with places to recuperate if they were suffering from exhaustion. These places gave them some time in green pastures away from the war. Of those that survived, not all made it back to England. It was expensive to ship horses across the English Channel. Many were sold to butchers in France, or auctioned off to French farmers for very little money so that Britain didn’t have to transport them. All in all, not a great way to treat animals who had fought just as hard as their human counterparts, but there were some happy stories. In some cases, soldiers pooled money together to bring their favourite horses home and give them a good life after the war. The plight of war horses was the subject of the book War Horse by Michael Morpugo, which was turned into the famous Steven Spielberg movie of the same name.